Product #16614 | SKU SG2LRG6 | 0.0 (no ratings yet) Thanks for your rating! 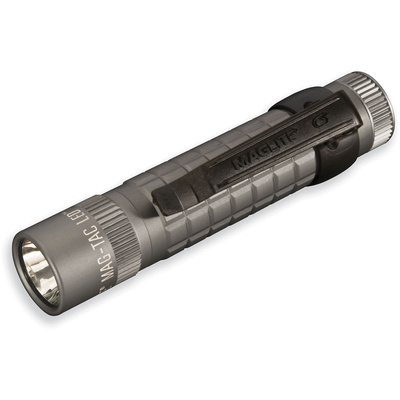 The urban gray Mag-Tac LED Flashlight from Maglite is a handheld illumination tool designed for civilians yet reliable enough for tactical professionals. Its 310-lumen LED light source is capable of producing a beam visible at a range of 200 yards. Like other Maglites, the Mag-Tac is machined from a lightweight aluminum alloy, anodized inside-and-out for enhanced corrosion-resistance, and manufactured in the United States. Maglite's proprietary Quick-Click mode selector tailcap enables the operator to set the Mag-Tac output mode without cycling through the other modes each time the light is activated. When the tailcap is in the Momentary position, the flashlight will only illuminate while the switch is pressed. In addition to momentary activation, the Mag-Tac also has full-power and power-saving modes for constant illumination. A weather-resistant housing, deeply knurled grip, and included pocket clip help make the Mag-Tac a full-featured illumination tool.